WEST TOWN — It's an unusual sight, this row of young fig, apple and pear trees growing in an industrial section of West Town. Stranger still: The trees have taken root in eight inches of soil, on a warehouse rooftop 15 feet off the ground. 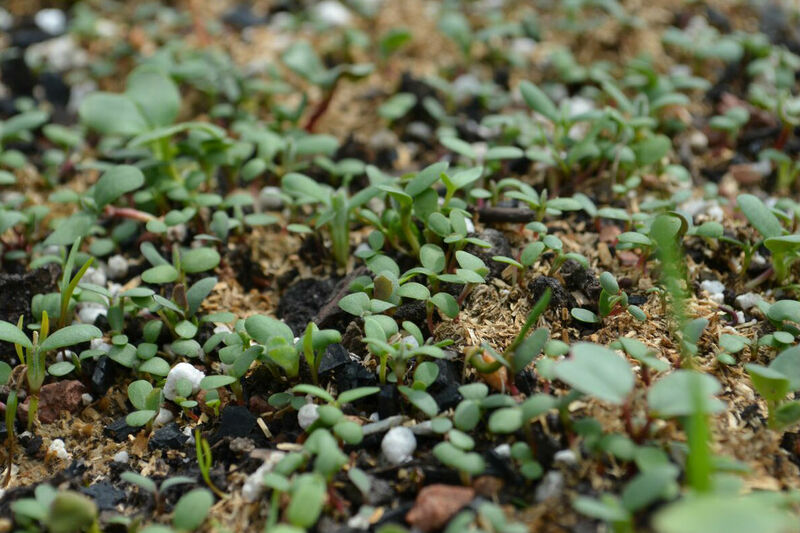 In July, once the cover crop blanketing the roof at 1516 W. Carroll Ave. is fully established, the first daikon radishes and greens will be harvested. A few weeks after that, the tomatoes, peas and chard should be ready. Green roofs and urban farms are on an upswing in Chicago. 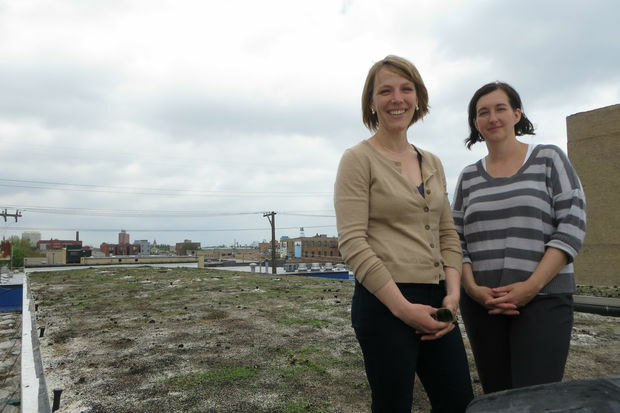 This one, The Roof Crop, is unique and not just for its unexpected location, founders Tracy Boychuk and Molly Meyer said. The Roof Crop is centered around a contiguous growing system developed by Meyer, called Omni Ecosystems, that's unusually lightweight, irrigated and easily replicated. Here's the twist in the business model: Acting essentially as tenant farmers, Boychuk and Meyer will install, maintain and harvest the Omni systems at other buildings under lease agreements. For building owners willing to make the investment, this can translate into not only a food-producing, energy-saving roof but an income-generating one as well. "You can't just have one isolated island on one rich person's building," said Meyer. "To make it a reality, you have to make it financially viable." Boychuk is a former music industry executive and founder of Runner Collective, which offers business support to artists, designers and other creative types. Meyer spent years studying and building green roofs in Germany, which has long been at the forefront of green roof technology. Meyer also installs living walls; she did the one at Nico Osteria in the Gold Coast. In 2011, Boychuk hired Meyer to put a green roof on her garage. The women got to talking. "She told me she was developing a system that would do food production on roofs," Boychuk said. Boychuk's garage wasn't the right place for it. But with the city's approval that year of a zoning ordinance allowing for rooftop farming, among other things, the proverbial seed for Boychuk and Meyer's future business venture was planted. To encourage green building, the city offers incentives such as expedited permitting and matching grants for green roofs. As of 2013, there were 509 green roofs within city limits, according to the Department of Planning and Development. While a green roof costs more than a conventional one — at least double, by some estimates — advocates say it ends up paying for itself and then some. Green roofs absorb rainwater, help improve air quality and reduce a building's energy load, markedly so in summer. Roofs last longer under vegetation. They look pretty, too. The problem, as Meyer sees it, is in their underdeveloped, even wasted, potential — swaths of sedum left largely unchecked over time or clunky, poorly designed systems that lose soil with every heavy wind gust. "There's no agency that really holds people accountable," Meyer said. "There are a lot of green roofs in the city that just lay without plants. In some cases that's OK, but it's sadly something that's not living up to its full potential." If a building takes the steps to install a green roof, Meyer and Boychuk reason, why not make it edible? "There's no risk in it," Boychuk said. The Omni system isn't just a bunch of planter boxes. Fully grown, The Roof Crop will look and act like a meadow, with grasses and pollinator magnets such as marigolds growing amid clusters of complementary crops — tomato plants circling a bunch of basil, for example. "We're taking the concepts of permaculture and putting it on rooftops," Meyer said. The unique growing media, developed by Meyer's colleague Michael Repkin, mimics natural soil, allowing for quick and extremely diverse production and the development of an entire ecosystem — from earthworms to praying mantises — above ground. The Omni system is anywhere from one-quarter to a fifth of the weight of a typical food-producing green roof, Meyer said. Basic installation for a 5,000-square-foot roof runs roughly $15 a square foot, she said. That's about the same as a typical green roof. The Roof Crop's showcase will be the Carroll Avenue farm, which spans 7,800 square feet and three tiered sections of the roof. The two highest productivity sections, where the fruit trees are planted and watermelons and pumpkins later will grow, are eight inches deep. The middle section is four inches deep but can yield three-foot-high kale plants. Boychuk and Meyer are developing a public crop box program to start in August when harvest is in full swing. Until then, Boychuk said they'll likely give away what's grown, sending some to local restaurants to drum up wholesale business. Boychuk said she would like to offer people the option of paying by the week for the crop box and choosing from a list of produce — and flowers. She has arranged for a bicycle messenger service to deliver the boxes to customers for a fee. Pickup at The Roof Crop would be free. When the warehouse rehab is complete, there will be a 1,000-square-foot growing area on the ground floor for winter production, a small retail farm stand, event space and, naturally, a living wall. Boychuk and Meyer also are moving their offices into the building, which they are leasing. "Worst case scenario," Boychuk said, "even if it's a complete bomb, what an amazing place to work in."